Easter seemed like the perfect day for a trip to Sandy Hook for the annual nesting season of the Piping plover. It was a beautiful day, breezes on the shore were soft and reasonably warm, and, well, who doesn't like a good Peep? Piping Plover adult. U.S. Geological Survey/photo by Susan Haig. Besides their overall loveableness, Piping plovers deserve our regard as a federally threatened species, with fewer than 2000 breeding pairs in the Atlantic population. Over-development along the shoreline and indiscriminate human behavior on the beach are among the biggest perils to these little guys, so state and federal parks are usually the best places to find them. It's always good to see them return in the spring, and every successful brood is cause for celebration. The top of the hook -- North Beach and above -- is generally a reliable place to find the plovers, which means a hike along Fisherman's Trail. It's a good workout, tromping a sandy path over small dunes and mounds that shift below your feet. Who needs the gym? Neither Ivan nor I had been to the end of the trail since Hurricane Sandy came through, but the beach seemed to be in pretty decent shape. Inland from the water's edge, a wide expanse of sand was cordoned off for the explicit use of nesting protected birds. As always, a variety of gulls was making their presence known in the sky above and on the beach. American oystercatchers were easy to find, their orange bills and dark backs and heads contrasting nicely with the sand. The plovers, not so much. Imagine trying to find a tiny bird, the color of wet sand with some white thrown in, on a damp beach strewn with shell shards. It ain't easy. On the plus side, it gives you a real respect for the power of camouflage. But you're left scanning yards and yards of what looks like empty beach, hoping to detect some movement that's not a stray piece of paper or plastic fluttering in the breeze. Some knowledge of their habits helped us eliminate part of the beach right off the bat. We figured they'd make themselves scarce among the gulls and oystercatchers, both of which are known to dine on plover eggs and chicks. Passing a good stretch of sand, we got to some yardage seemingly free of all life but for random dune grass in the distance. And then... there was movement. They weren't easy to focus on, but about a half dozen plovers were rushing among the beach detritus, looking like house hunters power-walking to the next real estate listing. We felt reasonably sure they were still checking out neighborhoods, because the usual unmistakable signs of nesting weren't yet there. The thing about Piping plovers is that depending on the time of season, the nests can either be near impossible to locate, or darn easy. Unlike the construction of twigs or grass that most birds generally use, plovers' nests are pretty much just uncushioned scrapes in the ground, their mottled tan and white eggs laying in a slight depression that might be decorated with shells or pebbles as camo. That makes them almost invisible. If the area wasn't cordoned off, folks might mistakenly step on a nest without realizing it. Ironically, it's the benign hand of man that makes the nests easy for birders to find. On Sandy Hook, for example, the National Park Service reserves parts of ocean-facing beaches with regulations and signage to keep the birds from being harassed. The dunes are roped off from March 15 through Labor Day, and visitors are reminded that dogs are allowed only on the bay-facing beaches, where the plovers don't nest. If you wait long enough in the season, your search for Piping plovers is aided by the large chicken-wire structures the Park Service erects around the nests the birds create on the beach. The holes in these exclosures are large enough to allow the plovers to leave easily to forage for food, while being too small to allow predators in. Raccoons, cats, skunks and foxes are all known to go for plover eggs and chicks. 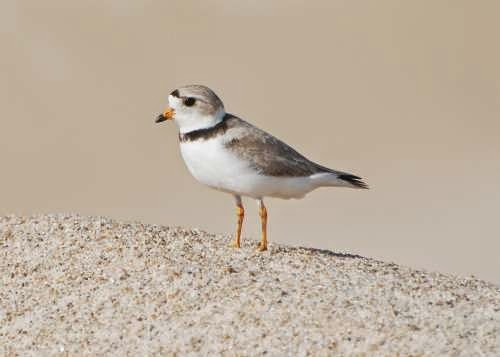 Piping plovers generally lay clutches of two to four eggs, which hatch in about 25 days. Born with pinfeathers, the chicks are mobile almost immediately and will follow their parents around as they graze for food. In about another month, the youngsters will be ready to fly, provided they survive predation. Parents will feign a broken wing to distract predators from the nest, as the little ones lay motionless in the sand, nearly invisible thanks to their camouflage. That's not to say that Piping plovers won't stand up for themselves. Other birds who approach the nest will be chased, bitten or pecked, possibly leaving an enduring injury. Like us humans, plovers are generally off the beach by the middle of September. They often gather in groups in quiet staging areas before heading south to the gulfshore and beyond. For now, though, they're counting on us to share the beach with them as they start another generation of adorable birds. *Technically, Piping plovers aren't included among the shorebirds generally categorized as "peeps" by birders. Those would be a certain group of Sandpipers. I just couldn't resist the Marshmallow Peeps reference.